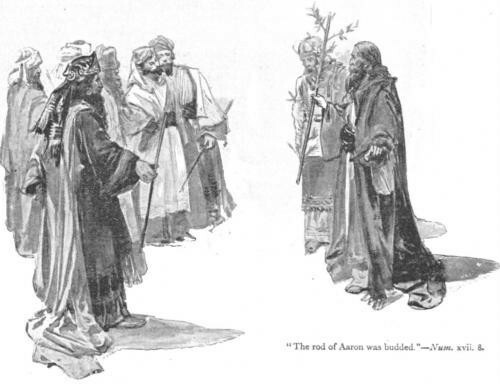 MormonInfo.org - FAQs - Aren't the two sticks mentioned in Ezekiel 37 a reference to the Bible and the Book of Mormon? Keith Meservy in his article, "Ezekiel's Sticks and the Gathering of Israel" (Ensign [Feb. 1987], 4), makes a case to support the LDS position that Ezekiel 37 was referring to two books of Scripture when it talked about the two sticks in verses 16-20. Even though it was nice to see Meservy not attempt to say that Ez. 37 was referring to anything other than a "stick" (like a "scroll" as LDS generally do), he still thought this could be a reference to wax writing tablets which symbolize the Bible (for the stick of Judah) and the Book of Mormon (for the stick of Joseph). But there are certain problems with assuming this is what is going on in this passage. Even if it is true that these sticks do refer to wax writing tablets, there is still no indication that Ezekiel had any further reference to "books" or "records" in this passage. This is the primary problem with the article. Meservy freely assumes that Ezekiel had some other meaning in mind than what the passage clearly says, viz., that the two sticks were symbolizing two nations that would come together to be one again (Ez. 37:18-23). All Ezekiel was told to write on the sticks was "For Judah, and for the children of Israel his companions" and "For Joseph, the stick of Ephraim, and for all the house of Israel his companions." That's it, and that is why it fits nicely with the tribal staffs in Numbers 17; the staffs identified the particular tribes similar to the Native American totem poles. (Meservy thinks that simply because two different terms are used for "stick" in the Numbers passage and the Ezekiel passage, they must be referring to two entirely different things. But even if Num. 17 uses a different term than Ezk. 37, that is no reason to conclude that they are referring to two different things. There are obviously synonyms for the term "stick" [e.g., rod, staff, etc.].) The two nations were representative of the split in Israel, but they would be brought together again as Ez. 37:18ff. specifically says. For Meservy to read something more in here is simply begging the question. This is typically bad cultic thinking, and it clearly demonstrates the lengths to which cultists will go to justify their position. Cultists force an interpretation on the passage to make it fit their latter-day revelation. But in this particular case, why does it symbolize "Judah's records" and "Joseph's records" rather than just simply "Judah" and "Joseph" like the text says? For Meservy and other LDS, it symbolizes the former rather than the latter simply because this is how the Mormon cult assumes it to be. Another reason to reject the LDS view is that it does not fit the context. Earlier in the Ezekiel chapter, God speaks of the valley of bones and how He put them together with life to form a great army. Verse 11 says that these bones are the whole house of Israel. It would be equally crazy to assume that these bones symbolize the writings of Israel. And it would be begging the question even further to assume that this simply meant the writings contained in the Bible and the Book of Mormon. It seems unlikely that "Judah" in verse 16 would be representative of the whole Bible, particularly when not all its writers were from that tribe. 1: The reason the Bible is referred to as the stick of Judah is because it was a record of the people of Judah or the Jews. I didn't say that all of the writers were of the house of Judah, but that it was a record of Judah. To think otherwise is simply, as you put it "begging the question."